It’s that time of year again. Around the same point every year, the whole “rock music is dead” debate rears its head and it is swiftly dismissed as bullsquirt. As luck would have it, Slash has just released one of the best rock albums of the decade. 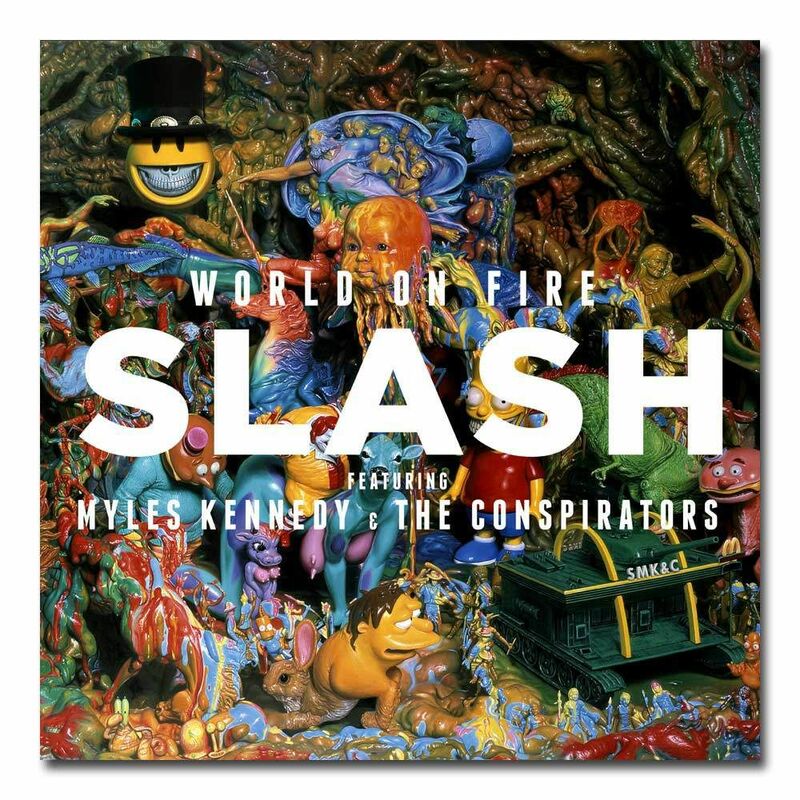 Featuring Alter Bridge frontman/God-like genius Myles Kennedy on vocals and his touring band, known as The Conspirators, World On Fire is a solid gold slab of adrenaline fuelled, fist pumping hard rock. From the shamelessly cheesy title track to the closing epic ‘The Unholy’, it’s clear that Slash can still write a fantastic riff, and Kennedy’s soaring melodies and golden voice take the songs to another level. ’30 Years To Life’ channels his Guns ‘N’ Roses years, while songs like ‘The Dissident’ and ‘Avalon’ display much a heavier, more modern edge. However, it’s not all rock and roll played at 800 mph; ‘Beneath the Savage Sun’ displays a sinister, slow stomp and riffs that Metallica would be proud to call their own; ‘Dirty Girl’ is the funkiest song that the top-hatted maestro has ever written; ‘Shadow Life’ has a groove to die for; and ‘Battleground’ is a beautifully performed power ballad, complete with a “la-la” bridge, and the best vocal performance on the album. It’s far from perfect though. ‘Bent To Fly’ doesn’t really take off (BA DUM TISH! ); the instrumental ‘Safari Inn’ is effectively as four minute Slashterbation (trademark pending) session; and, at 17 songs totalling 80 minutes, it’s a bit of a lengthy affair. Posted in Music and tagged album, review, rock, slash, world on fire. Bookmark the permalink.